Soccer is an anaerobic sport that consists of rapid bursts of activity followed by short periods of rest. 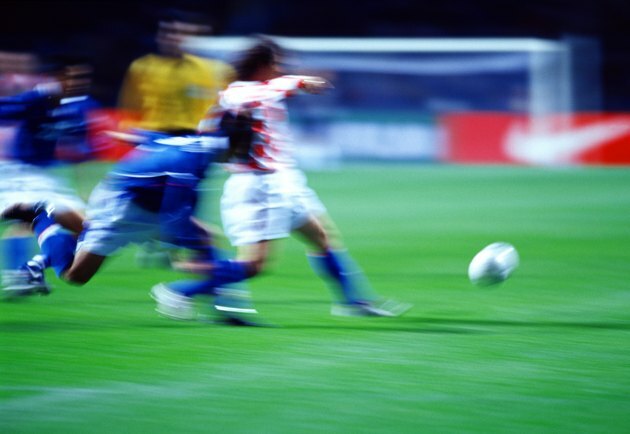 To be successful, a soccer player must have pure sprinting speed but also the ability to dodge other players and make tackles, which requires agility. Speed and agility are best developed during the off-season so players start the competitive period as well prepared as possible. Soccer players seldom run in straight lines. They need to be able to dodge opposing players trying to tackle them for possession of the ball. To improve your multidirectional running ability, perform zig-zag sprints. Place 10 cones or flexible poles in a row with 6 feet between each. From a standing start 10 yards before the first cone, accelerate toward the first marker and then sprint through the cones as fast as you can. Stay as close to the obstacles as possible and focus on sidestepping rather than wide, sweeping turns. You can make this exercise more challenging by reducing the distance between the markers or by dribbling a soccer ball. This drill is a variation of "suicides" used in basketball training and develops sprinting speed while also addressing the ability to change direction quickly -- both of which are essential in soccer. Place five cones on the ground 5 yards apart. Stand next to the first cone. On go, sprint to the first cone and back to the beginning. Immediately run out to the second cone and then back. Repeat the process and run to cone No. 3 and then cone No. 4. The drill is complete when you get back to the beginning, having covered 100 yards. Rest for a minute and repeat. This drill will improve your running tempo and knee lift, which transfers to a faster sprinting speed and is best performed using an agility training ladder. An agility ladder is a flat framework of boxes that can be used for a variety of drills. Stand 10 yards from the end of the ladder and begin jogging on the spot. Lift your knees high so your thighs are parallel to the floor. Keep your knees up and run forward while focusing on a fast foot strike rate rather than forward speed. Run the length of the ladder, ensuring you step in each box once with each foot. At the end of the ladder, accelerate and sprint 20 yards. Walk back to the beginning and repeat. T-sprints teach you to change direction quickly and also help with multidirectional sprinting speed. Make a large "T" shape using marker cones. The horizontal and vertical axis should be 10 yards in length. Stand at the bottom of the vertical axis. On go, sprint forward and touch the first cone. Sidestep to your left and touch the left cone. Sidestep to your right and touch the right cone. Sidestep to your left to return to the center cone. After touching it, run backward to your starting position. Rest a minute and repeat. You should always face forward when performing the drill. What Is a Gasser CrossFit Football?